Help, does anyone know the size of a tube tester? I am getting a old store tube tester but I need to know about how big it is. It is like the one below. I can bring it home with a Jeep liberty and the jeep can haul something 5 feet tall, about 40 inches wide and about 30 inches deep. I was wondering if anyone has one or familiar with it. From what I have been told the tester will come off the cabinet. It looks like this one from what I have been told. Re: Help, does anyone know the size of a tube tester? Most of those units have the tester as a unit that can be placed on different types of bases, from a cabinet like the one shown, or one that will allow placement on the owners' countertop. If it is like the one pictured, I would bring along a few hand tools in the event the tester is fastened to the top of the cabinet. The metal bodied ones usually just have the tester nested into the cabinet top. If yours is like the one pictured, it's a nice catch. Sweet find! All those drawers to store your tubes. I like. Some taking apart may be required! One of my favorite memories is going to the local Radio Shack, or even Taylor Drug store, with my dad and a bag of TV tubes. Back then almost anything wrong with a TV was a tube. For some reason the part that sticks out in my mind is the tube straightener. 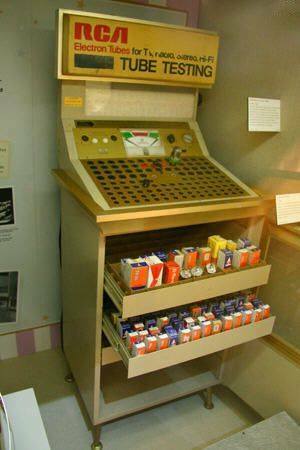 I remember the U-TEST-UM tube tester. In fact that what I call tube tester now.